Having a Queen Anne wingback chair in your parlor or bedroom can create a romantic ambiance whether or not you have a historic home. The Queen Anne style is a graceful classic which is as beautiful today as it was in Colonial times. Queen Anne was an English queen who reigned from 1702 to 1714. During those twelve years, the style of English furniture went from clumsy to graceful and elegant. Furniture makers began to look more toward what was popular in Europe at the time and created a style unique to England. The furniture style that bears her name is generally agreed to have been produced from 1725 to 1750. What Is Plantation Style Interior Design? The wingback chair was always fully upholstered, leaving the wood cabriole legs exposed. The top of the chair was designed with a graceful curve, making it feminine and elegant. The sides of the chair were curved slightly inward as well, not only for aesthetic value but also to keep the chair's occupant warm in the drafty, cold houses of the time. It should be noted that most Queen Anne chairs from colonial times are not upholstered. Generally, if they are antique, they are Victorian in origin. The Victorians fell in love with the delicate Queen Anne style and adopted the wing chair for their own use. These chairs were often called Grandfather Chairs because they were used in the bedrooms of elderly, frail, and ill people so that the patient could sit near the fire without fear of catching cold from the drafts at his back. It can be difficult to identify Queen Anne wingback chairs and other furniture because they may have some of the same design elements as William and Mary or Chippendale styles. In America, the Queen Anne style was still being created at the dawn of the Revolutionary War and was also recreated during the Victorian Age. Cabriole legs were unique to the style, having never been used before. They were styled after the rear legs of a leaping goat. The style was functional as well as beautiful. Because of the way it is cut, the balance allows the legs to support heavy furniture on slim legs. No stretchers need to be used. Trifid feet replaced ball and claw feet of the large, bulky William and Mary style. The trifid foot had three pads carved into the top, which made it look a bit like a dog's paw. Queen Anne chairs may also have simple pad feet. In the latter years of this period, mahogany was imported and came into favor as well. This was used in the wealthiest homes; it was too expensive for many people to afford. The chairs as well as the other furniture were smaller in scale than the previous styles had been. The contours were designed as much for comfort as for style. The seat was wide and could accommodate the voluminous skirts worn by the women of the day. Following are some images of antique wingback chairs and their details. While each is unique, you can still clearly see the elements of the style in each. 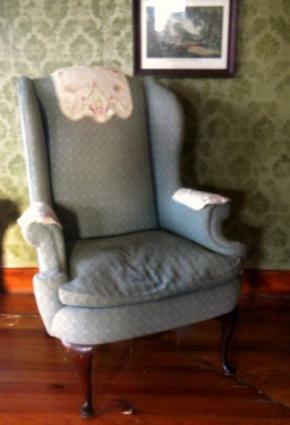 Wingback Chair from the Colonial period. Carved drake foot on a Queen Anne armchair. Cabriole leg, carved with a shell and ending in a trifid foot. It is not easy to find an authentic Queen Anne wingback chair from Colonial times. In order to do so, you will usually need to contact a fine antiques gallery; you aren't likely to find what you are looking for at the local antique mall. When you do find one you should expect to pay several thousand dollars. If, however you are willing to get a Victorian Queen Anne chair then you can often find them locally or online. You will probably find that the piece needs to be recovered – unless you are very experienced at upholstering antiques you should leave any repairs to a professional.